Can this Movement Make D.C. See? State Sen. Jeff Danielson co-chairs No Labels in Iowa, along with former Lt. Gov. Joy Corning (right). 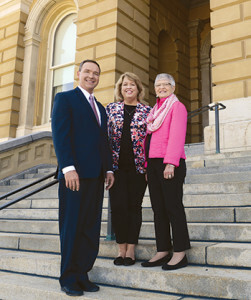 Peggy Huppert (middle) is the bipartisan organization’s state executive director. During the Iowa State Fair last August, amid eating deep-fried food on a stick and seeing the butter cow, nearly 6,000 fairgoers stopped by a booth with the banner “No Labels” above it and signed up in support of the national movement. The nonprofit initiative was launched in 2010 with the lofty goal of moving Congress and the federal government beyond partisan bickering to begin addressing a set of national goals that both parties could agree upon. Iowans’ involvement in the fledgling organization could prove to be a crucial part of No Labels’ campaign to build awareness of its strategy for ending the cycle of gridlock in Washington. After gaining some traction in Washington, D.C., in the past several years, the organization is now gearing up to engage caucus goers in Iowa and primary voters in New Hampshire this fall. Co-chairing the Iowa organization with Danielson are former state Sen. Maggie Tinsman, a Republican, and former Iowa Lt. Gov. Joy Corning, also a Republican. In March, the organization hired a state executive director, Peggy Huppert of Des Moines, who eight years ago led Iowans for Sensible Priorities, a campaign to reform the federal budget process. No Labels was created by former Utah Gov. Jon Huntsman, a Republican, and U.S. Sen. Joe Manchin of West Virginia, a Democrat, on the premise that Democrats and Republicans can unite around big goals that resonate with all Americans, regardless of their political party. One of No Labels’ most significant accomplishments has been to establish a bipartisan caucus of “Problem Solvers,” made up of about 80 members of Congress who meet regularly to help build trust across the aisle. Cooperation fostered by No Labels has led to 17 bills that have been written and co-sponsored by the Problem Solvers, among them the No Budget, No Pay bill that became law in 2013. Two members of Iowa’s congressional delegation, freshman Sen. Joni Ernst and Rep. Dave Loebsack, have signed on to No Labels so far. Create 25 million new jobs over the next 10 years. Secure Medicare and Social Security for another 75 years. Make America energy-secure by 2024. Tinsman, who is also a newcomer to No Labels this year, says she likes the fact that the organization is taking the same approach of using civility as 50-50 in 2020, the women’s political leadership mentoring group whose board she co-chairs. “It means there’s probably more than one way to solve the problem, but you have to cooperate with people who may not think like you,” she says. 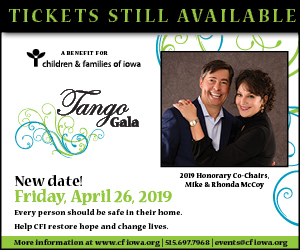 Huppert most recently worked as senior market manager for the American Cancer Society’s Iowa chapter, and from 2008 to 2012 was Iowa government relations director for the organization. During the 2008 caucuses, she led a staff of 12 for Iowans for Sensible Priorities, a million-dollar awareness campaign that attracted about 12,000 supporters who participated in the Iowa caucuses. The state organization also has established student chapters at Iowa State University, the University of Iowa and the University of Northern Iowa, as well as at Drake University and Cornell College, Huppert says. Those five Iowa chapters are part of more than 100 student chapters that No Labels has organized so far nationwide. Danielson says No Labels’ meeting forums could range from small gatherings at local libraries to regional town hall meetings. “We’re open to different techniques of how to engage people, but it will be all small-group meetings where people can engage civilly, because that’s what our caucus process encourages,” he says. For more information about No Labels and to get involved, visit NoLabels.org/tags/Iowa.